Container spot rates from Asia continued to soften this week, impacted by a slowdown in demand following the Chinese new year holiday (CNY). The Shanghai Containerized Freight Index (SCFI) saw its comprehensive index shrink 5.6% to 729.49 as all the major tradelanes suffered a second week of rate declines. The Asia to North Europe component of the SCFI slid by a further 4.4% on the week to $791 per teu, and has now fallen below the market rate of a year ago, which was about $850 per teu. However, Asia to North Europe ocean carriers can at least be cheered by freight rate benchmarking firm Xeneta, which said that according to its crowdsourced data of agreed contract rates, the drop in rates post-CNY has not been as marked this year in percentage terms; falling by 7% this year, compared with 13% in the equivalent period of 2017. With spot rates softening and carrier FAK rate increases on hold, shippers that have stalled over renegotiating longer-term contract rates are starting to “achieve heavier discounts than those secured in Q1,” said Xeneta. “If long-term contracts and FAK rates become more closely aligned, as they were in the final three months of 2017, then further discounts to spot rates could become a reality,” said Patrik Berglund, chief executive of Xeneta. Moreover, carriers will need to build into new contracts their extra fuel costs and a provision for expected oil price increases. Meanwhile, spot rates for Mediterranean ports are also lagging the rates of the same period of 2017, which were about $854 per teu. This week the SCFI recorded a rate of $701 per teu – down another 2.8%. However, there could be tragic reasons for rates to rise, albeit temporarily, on Asia-Mediterranean. The Maersk Honam caught fire in the Indian Ocean on Tuesday. One crew member is known to have died and four others are still unaccounted for. The ship was loaded with 7,860 boxes (12,416 teu) destined for ports in the west Mediterranean. The salvage operation is led by Smit Salvage and Ardent. 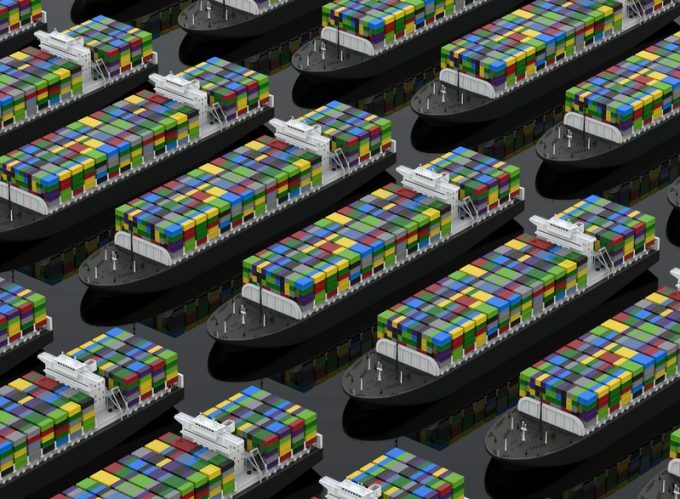 Notwithstanding the eventual salvage of undamaged containers in the aft holds of the stricken ship, which will be further delayed by a lengthy general average process, Asian shippers will need to promptly despatch replacement orders to ensure that retailers do not run out of goods. In the case of the 8,110 teu MOL Comfort, which broke in two in July 2013 off the coast of Yemen, en route for North European ports, spot rates spiked in the aftermath as shippers booked urgent replacement consignments. The ill-fated MOL Comfort had a much smaller load of 4,382 containers, but its total loss still caused a period of consumer goods shortages. Elsewhere, just as annual contract negotiations with BCOs began, transpacific carriers saw spot rates from Asia to the US, as recorded by the SCFI, erode further. For the US west coast, rates fell by 8.7% to $1,143 per 40 ft, and for east coast ports there was an 8.2% decline on the week to $2,181 per 40 ft. This represents a significant drop on transpacific rates year-on-year, which stood at $1,496 and $2,955 per 40 ft respectively for the US west and east coast.